I've owned my DC-5B head for about 4 years now, and I'm still experiencing trouble dialing in the tone I hear in my head. (It gets REALLY close, and I know that this head is capable of delivering me some "Master of Puppets" chunky goodness.) For tubes, I am using Electro Harmonix 12AX7EHs in the preamp, and JJ 6L6GCs in the power section. For speakers, I have a Marshall 1960A cab loaded with Celestion G12T-75s. I assumed that since these speakers have a scooped sound, it would tame the excessive mids of the DC-5, and it does indeed get rid of the honky mids. The problem is the FIZZY HIGH END AND LOOSE LOW END! ARGH! So: WHAT DO YOU GUYS RECOMMEND? Should I opt for Mesa tubes? Or are there more high gain alternatives? 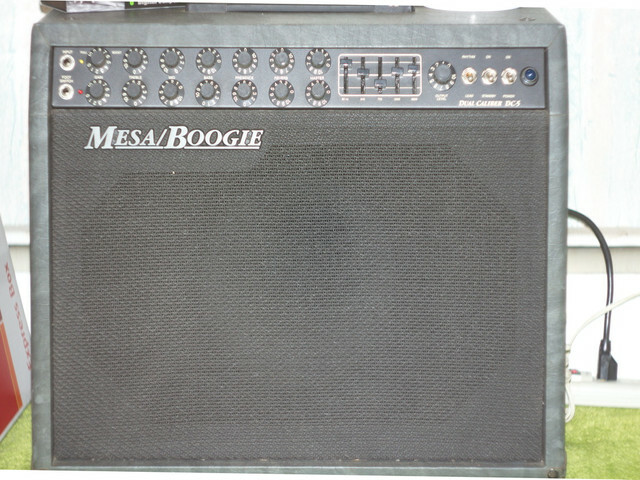 Should I buy a Mesa cab with V30s? Do you guys have any settings you could share? At this point, anything helps. Really. 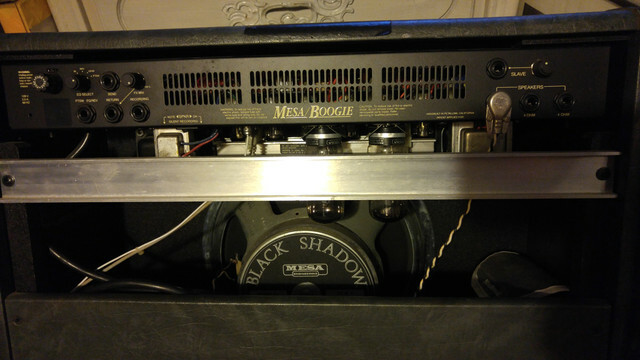 - Mesa Traditional 4x12; Celestion V30s. Don't know how much this will help because I use a DC5 combo with the stock speaker, no boost pedal although I had a TS9 style pedal on the board. My "not in storage cab" is a 2x12 closed back with Celestion Greenbacks. I haven't tried it with the DC5, but now you have me curious on what it would sound like. 2nd pic is the at work cover/karaoke settings. Slightly different. Was using these settings for Van Halen, Enter Sandman, Final Countdown, Down by 311 and using the the guitar volume pot to adjust the input. Pulled the settings from a Petrucci discussion thread about 8 years ago. Last edited by YaBoiMCaliber on Tue Jan 16, 2018 9:16 pm, edited 1 time in total. jediguitarist wrote: Don't know how much this will help because I use a DC5 combo with the stock speaker, no boost pedal although I had a TS9 style pedal on the board. My "not in storage cab" is a 2x12 closed back with Celestion Greenbacks. I haven't tried it with the DC5, but now you have me curious on what it would sound like. - Do you notice any flub or boominess in the low end with your settings? Almost every comment I've encountered regarding the DC-5 says to keep the bass below 3. I also noticed that with my amp, the tone gets darker and more bassy as I turn the output level up. - Is that the Revision A DC-5? How much gain does it have? I have the A with the Black Shadow. That's based on the two position Rhythm/Lead switch and the five-way rotary on the back to choose EQ assignment. The B has a three position Rhythm - Lead - Lead EQ and two position toggle on the back for EQ. I do get some flub in the low end, but it "corrects" itself once I get to stage volume. Could also be the mix on stage, but whenever I've listened to the DC-5 through the mains, there's not low end mush. I think there's plenty of gain on the amp. At least as much as my Mark IV and quad. Definitely different sounds but that's probably the tone stack. I haven't played the amp in a while. Within the next couple days, I'll set the controls back to 0 and try to dial in some decent tones. Maybe my tone taste has change some. I also have a DC-5b head. Neither flub nor fizz comes to mind with my sound. My cab may have something to do with it. I'm using a 2x12 half back with c90's. You could try removing the screamer. Personally my ears associate fizz with diode clipping. I did use a TS9 for a while but with the gain all the way down & it was only for lead boosts where I wanted a tad more "honk". For me, honk & fizz always brings Tube Screamers to mind. As far as settings; you're prob all going to laugh but I dime all the knobs on the lead channel and adjust the GEQ to taste. I swear the thing gets more gain with the knobs all the way up. Ironically I could never get the GEQ footswitch to engage on the clean channel so I set it with the knobs. Also, I'm using all Mesa preamp tubes & a pair of 6l6WXT+(aka 6l6GC) power tubes. I'm a little confused on your description of the TS808 settings. 10 I understand is either all the way up or meant to represent the 10 o'clock position on a clock. That said, what would 10:30 be on the dial? Please, excuse my ignorance if I'm missing the obvious. BTW: I would have loved to have heard the DC-5-900 setup. I can only imagine a DC's preamp crushing the 900's power section. That's more or less how they did it I believe. jpistolas wrote: I also have a DC-5b head. Neither flub nor fizz comes to mind with my sound. My cab may have something to do with it. I'm using a 2x12 half back with c90's. You could try removing the screamer. Personally my ears associate fizz with diode clipping. I did use a TS9 for a while but with the gain all the way down & it was only for lead boosts where I wanted a tad more "honk". For me, honk & fizz always brings Tube Screamers to mind. 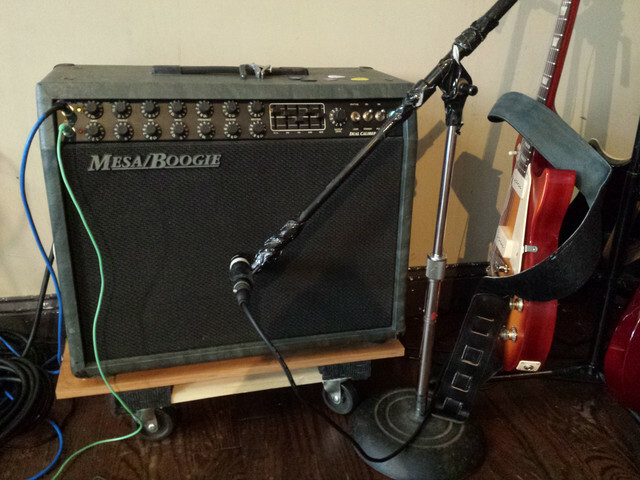 - My DC-5 had a power tube failure and fried a few resistors, so I sent it to Mesa in Petaluma to have it repaired. - While that was happening, I sold my Marshall cabinet and used the money to buy a used Mesa Traditional 4x12 with V30s. - Literally got the head back last week, and tried it with the cab. I was really worried at first because it sounded very honky overall, but I just needed to adjust because I haven't played through an amp in a while prior to that. - Once I did adjust, I realized how crushing it sounded when it was cranked! At lower volumes (around 1 - 1.5 on the lead channel master) it sounded thin and honky though. - I was actually able to score a JCM 900 too, so I'll try to record myself playing some Metallica riffs with the Mesa/Marshall setup this weekend. Oh, and for the TS808 settings, I was using "o'clock" positions. For 10:30 on the Overdrive knob in terms of a clock, visually the white dot would be pointing to the top left corner of the pedal.